I just made up this recipe on the fly and had it for lunch. It turned out really well! It's a very colorful salad that has a lot of visual appeal. 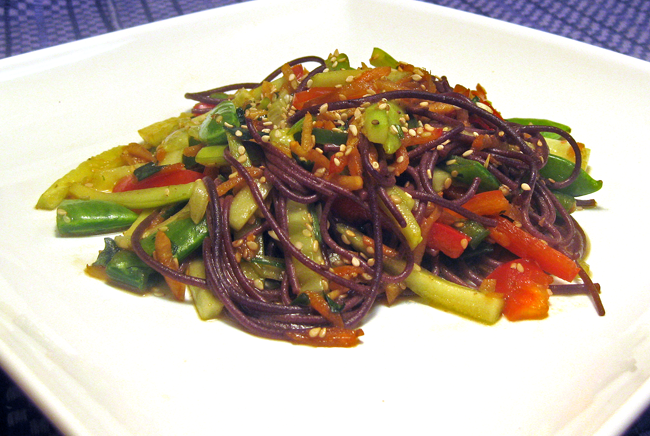 There are lots of brightly colored vegetables, which contrast quite nicely with the black rice noodles. It's really quick & easy to make. Probably takes about 15 minutes total to prepare, and then about 30 minutes to marinate in the refrigerator. You can make it the night before, and let it marinate overnight in the fridge for the next day's lunch or dinner. (In fact, it tastes even better after a day or two of marination.) It can be served either as a side salad or as a meal. If you're planning to eat it as a meal, just add a protein source like tofu or grilled/canned salmon, and you're good to go. Enjoy! While you're waiting for the water to boil & the rice noodles to cook, make the salad. Combine all of the salad ingredients together and set aside. Next make the dressing: In a mortar & pestle, pulverize garlic, ginger, & salt into a smooth paste, then add all remaining dressing ingredients into the mortar and stir thoroughly (with a small spatula) to combine. (The honey will probably be the most challenging to combine with the other ingredients. If you stir enough, it'll eventually meld with the other ingredients & then dissolve a bit, due to the acidic content of the lime juice & vinegar.) Set aside. 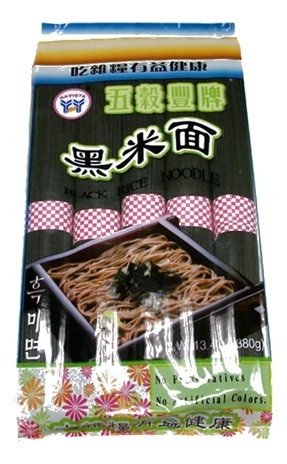 When noodles are ready, transfer them to a colander, drain, rinse with cold water, & then drain once more. Add to the bowl of salad, pour dressing on top, and toss well to combine. Refrigerate for at least 30 minutes to marinate salad and meld flavors. When ready, divide salad into equal portions, transfer to plates or bowls, and serve immediately. **Regarding Chinese star anise, please read this advisory before buying or consuming any type of star anise. Yes, it's a link to another recipe, but the preliminary exposition contains some essential tidbits that I strongly advise you read before consuming &/or cooking with any type of star anise. As I've mentioned above, you can always substitute aniseed for the Chinese star anise, if you prefer. Aniseed doesn't have quite the same flavor -- Chinese star anise has a lot stronger "licorice" flavor to it -- but it'll certainly suffice.